There are several ways to accept uploads on your forms each with its own ups and downs, this guide will show them all. 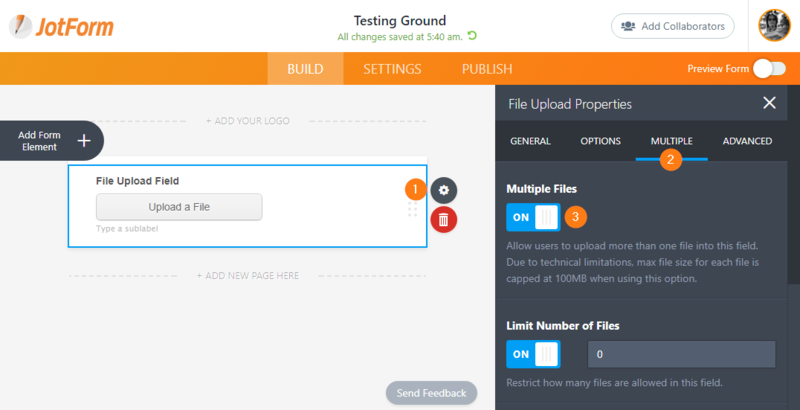 This is the easiest way to allow your users to upload a file to your form, and if you need to allow multiple files, you can change that same field to accept multiple file uploads. 1. 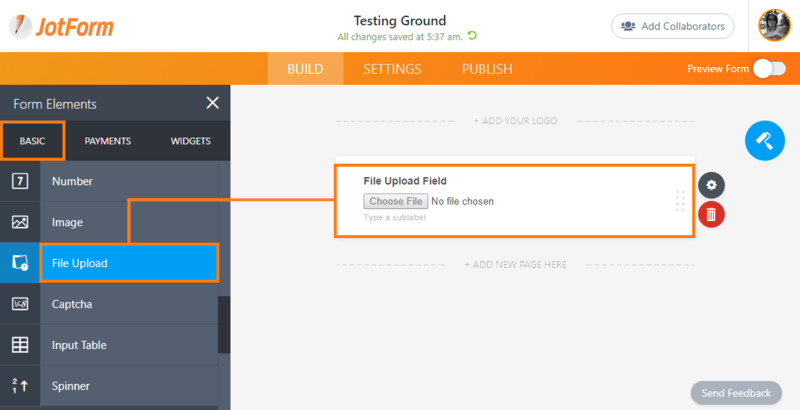 To do that, click the FILE UPLOAD field to highlight it then click the GEAR icon to open its properties. 2. Go to the MULTIPLE tab then toggle MULTIPLE FILES to ON. To learn more about adjusting the max file size, check our guide on Changing-the-upload-size-limit. And if you want to change the allowed file types, feel free to visit this other guide on Which-file-types-are-allowed-for-the-upload-field. Each platform offers some added/unique features so be sure check them out and use the one that fits your needs. When you refer to File Upload Field, is this the same as an attachment? I would like the user/s to attach (upload) a resume with the application. Is there a way to allow those filling out the form to select multiple files at one time. I use a form with this option, but my team has to click on upload>select documents>select gallery>select picture for each individual picture. Can You mass select photos? Can you upload files to and from Google Drive and choose where they get stored? Is there a way I can download all of the uploaded attachments? Instead of going into each application and downloading the file? where do the uploaded file go? unfortunately the 'upload a file' does not work? Any suggestions? What is the max file size limit for photos being uploaded? i kinda revived a form from 2013 and enabled it again. But now there seems to be a problem with the file upload. When i fill in the form and click submit i get an upload error screen. Can you help me? Is there a file size limit on JotForm's end, or can we set them to upload an unlimited number of files of an unlimited size? Is there a file purge time limit on JotForm's end, or do the files stay out there indefinitely? Can I create a form that will automatically add the uploaded form to me site? How to createa form from an existing source form? No file uploads, how am I over 10MB limit?